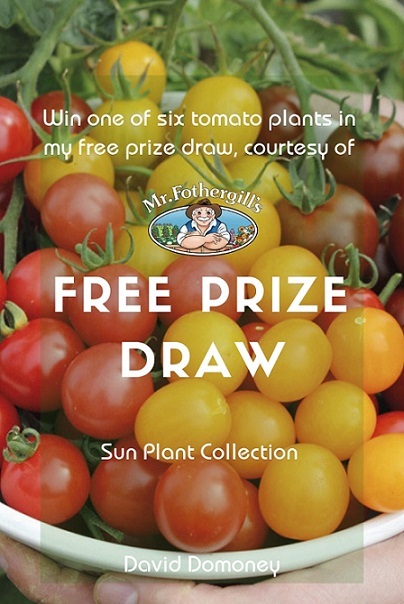 Enter my free prize draw for the chance to win one of six Mr Fothergill’s Tomato Sun Plant Collection. Ideal for growing inside or out (in a warm and sunny spot), they are classed as indeterminate, so will need staking or tying and the side shoots pinched out – a full growing guide will be supplied with your plants helping you to get the best results. Each collection includes 5 plants, 1 each of Sunchocola F1, Sunlemon F1, Suncherry Smile F1, Sunpeach F1 and Sungold F1. Read David’s expert guide on growing tomatoes. I love this site….just what I’ve been looking for…The builders are blockpaving my garden as we speak then the fun bit will start..